Many programs across the region help residents heal from illnesses in ways that promote physical, emotional, and spiritual resilience. One of the programs supported by the Community Foundation is the Southfield-based Kids Kicking Cancer. 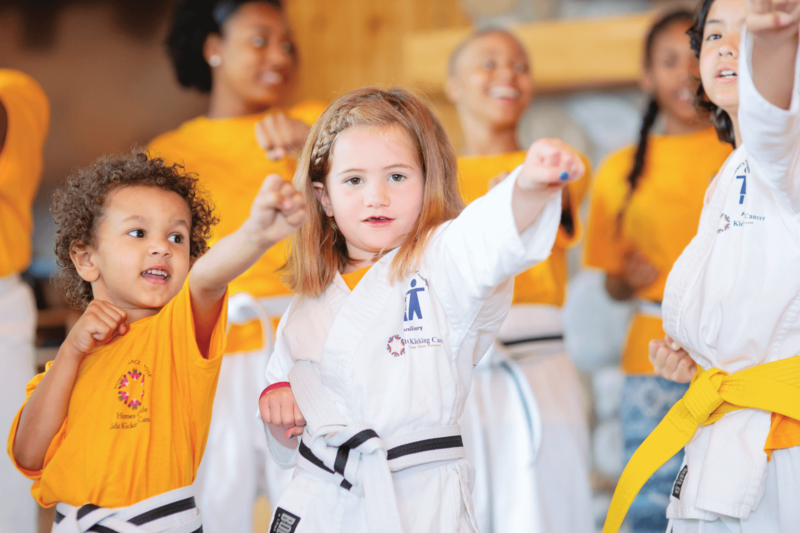 Founded in 1999 by Rabbi Elimelech Goldberg, the program has received worldwide attention for its work providing children with cancer a sense of power, peace, and purpose using breathing, visualization, relaxation, and martial arts. Program instructors use martial arts to empower and ease pain. Goldberg, who lost a 2-year-old child to leukemia, directed a camp 20 years ago for children with cancer. A black belt himself, he suggested to a child struggling with treatment that they use a breathing technique he knew from martial arts. The suggestion took the child’s mind off the treatment. Knowing he was on to something, Goldberg launched Kids Kicking Cancer with 10 children at Children’s Hospital of Michigan. The program now reaches more than 5,000 children in more than 50 hospitals in Michigan, New York, Boston, Chicago, New Jersey, Milwaukee, Los Angeles, Florida, Italy, Israel, Canada, and South Africa. In 2017, the Pink Posse was formed to help young breast cancer patients and survivors. Pink Posse is a program of Therapeutic Riding, an Ann Arbor-based nonprofit organization that offers therapeutic horseback riding to those with a variety of diagnoses such as autism spectrum disorder, cerebral palsy, and Parkinson’s disease. The organization received a grant from the Community Foundation to launch Pink Posse, which is designed to support young women with breast cancer. More than 8,000 Michigan residents were diagnosed with new cases of breast cancer in 2017. Breast cancer occurs less frequently in women under 40, but that patient population has specific needs and challenges. Young women affected by breast cancer may face childbirth complications, difficulty supporting young families, and employment challenges while coping with the disease and treatment. Participants in Pink Posse learn horsemanship and grooming skills, and improve their physical strength and capacity, which are often compromised as a part of cancer treatment. The program also helps participants with anxiety management skills and developing a support network. Therapeutic Riding serves residents from Washtenaw, Wayne, Jackson, Oakland, Monroe, and Saginaw counties. Programs such as Kids Kicking Cancer and Pink Posse are open to the community at large and help improve the lives of residents of southeast Michigan.